An attempt to provide a Marxist analysis of the Far Right in the US and Europe and to argue that it represents a modern form of ‘creeping fascism’. It was one of those moments when the world changed. Like the fall of the Berlin Wall in 1989, the bombing of the Twin Towers in 2001, and the financial crash of 2008, the election of Donald Trump as US president in November 2016 sent shock-waves across the globe. Commentators struggled for words. A billionaire tax-dodger, a ranting racist, a misogynist and self-confessed abuser of women, a bully who taunts the disabled and the bereaved, a serial liar, a man proud of his bigotry, his hatred, his contempt for most of humanity, this man had just been elected to the most powerful political position on the planet. Sixty-three million Americans had voted for a political psychopath. The election of Trump is the most significant breakthrough so far in the advance of a global movement. Trump, anticipating victory on the eve of his election, bragged it would be ‘Brexit plus, plus, plus’. He was referring to the victory of the Leave campaign in the British EU referendum. Nigel Farage, Boris Johnson, Michael Gove, and other right-wing politicians, backed by the gutter press, had secured a narrow win on the basis of vacuous ‘take back control’ rhetoric and vicious anti-immigrant racism. Creeping Fascism: Brexit, Trump, and the Rise of the Far Right is an attempt to provide a Marxist analysis of the Far Right in the United States and Europe and to argue that it represents a modern form of ‘creeping fascism’. 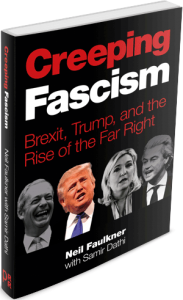 Creeping Fascism: Brexit, Trump, and the Rise of the Far Right is published by Public Reading Rooms.